Labour hoarding – the practice of retaining excess employees during a negative shock – could potentially help firms avoid re-hiring and training costs when economic conditions improve and act as a form of insurance for workers. This column uses Italian micro data to show how labour hoarding in the form of short-term work programmes can be beneficial despite being ineffective in the long term. The Great Recession has generated a significant revival of interest in policies designed to encourage labour hoarding by firms during downturns. By labour hoarding, we refer to the behaviour of firms that, in response to a negative shock, keeps more workers in their employment than would otherwise be currently ‘optimal’. The potential benefit of hoarding labour for firms lies in not having to go through the costly process of re-hiring and training new workers when economic conditions improve again in the future. By stabilising employment responses to adverse shocks, labour hoarding can also offer insurance to workers against economic fluctuations. The most emblematic policies to encourage labour hoarding are so-called short-time work (STW) programmes. These programmes work as subsidies for implementing temporary reductions in the number of hours worked by workers in a firm. STW programmes have been aggressively used during the Great Recession, especially in European countries. The fraction of employees on STW in 2009 reached 7% in Belgium, close to 5% in Germany, and 4% in France. In Italy, according to social security data, 4.6% of the workforce was in STW in 2013, at a cost of 0.5% of GDP. But what is behind this trend towards STW? Do we know that it is effective in stabilising employment? Is it really helping firms hold onto their productive workers? Is it an effective way to provide insurance to workers – more effective than unemployment insurance (UI), for instance? Are we not creating additional inefficiencies with these programmes, by keeping workers in unproductive firms, preventing an efficient reallocation of labour? Despite STW being a key element of the countercyclical policy toolkit, and one of the main active labour market policies utilised during downturns, answers to these fundamental questions are still lacking. This is due, in large part, to a critical lack of good data on STW programmes.1 But it is also because, in most countries, all firms get access to the programme, so it is difficult to identify the causal effect of STW treatment on the outcomes of firms and workers. Most of what we know on STW therefore relies on a limited set of cross-country analyses (e.g. Van Audenrode 1994, Boeri and Bruecker 2011, Cahuc and Carcillo 2011). Fortunately, a couple of recent papers using high-quality micro data provide important, novel insights on the effects of STW programmes. Cahuc et al. (2018) focus on France, while in Giupponi and Landais (2018), we study the iconic Cassa Integrazione in Italy, which is one of the oldest and largest STW programme in Europe. 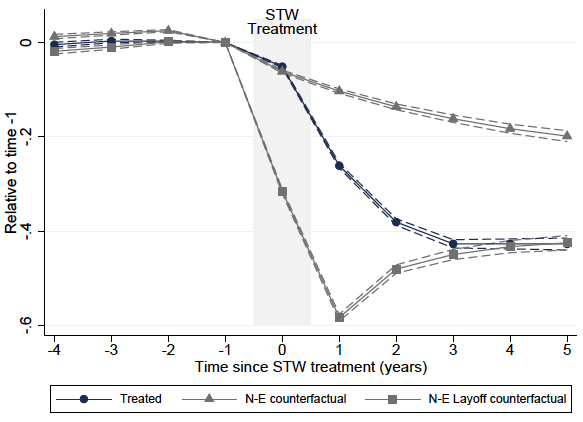 Both papers demonstrate that STW policies can have large real employment effects on treated firms. 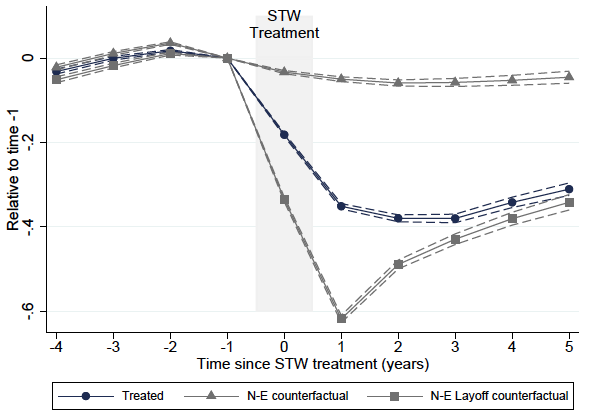 In our paper, we use the presence of variation in eligibility rules across firms to show that firms treated by STW experience a 40% reduction in hours worked per employee, and a 40% increase in the number of employees in the firm, with no discernible effect on wage rates. However, these employment effects do not last long. In Italy, the STW subsidy is only available up to one year, and the employment effects quickly disappear after the subsidy ends. 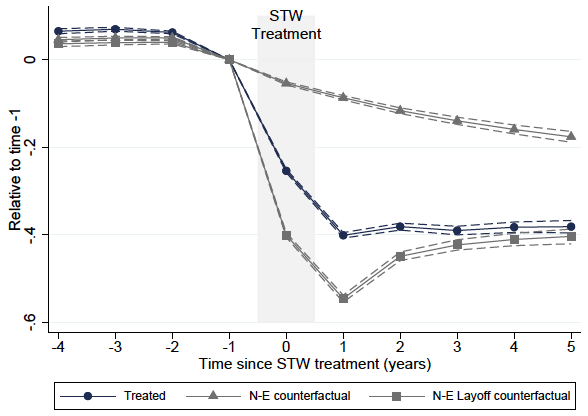 Figure 1 shows the evolution of various worker outcomes – the employment probability, the number of hours worked, and total earnings and transfers – around the time of STW treatment and compares workers who receive STW treatment (in blue) with two groups of similar workers who do not receive treatment. The workers in the grey square series are of particular interest – they are workers, similar to our treated group, but in firms who cannot access STW programmes, and who are laid-off. The figure shows that two years after STW treatment, there are no significant differences in the employment probability, earnings, and total income of workers who were treated by STW and workers who were laid-off. In other words, STW does not seem to provide any significant insurance to workers in the medium or long run. Another reason that may explain the absence of long-term employment effects of STW in the Italian context is the nature of the Italian recession, which was long and protracted. It is likely that when a shock is more temporary, the effects of STW will be larger and will last longer, as the desire for labour hoarding is much greater for temporary shocks, especially when the cost of replacing or training workers is high. Are short-time work subsidies worth it? In light of these new results, can we conclude that short-time work programmes are socially desirable? To answer this question, we need a conceptual framework that can clarify the trade-offs implied by STW policies. In other words, we need to know how the positive short run effects of STW on employment and workers’ earnings can be compared to the budgetary costs and reallocation costs of STW. Our analysis suggests that the welfare gains of further increases in the generosity of STW are small, but the value of having STW is significantly positive. In the absence of any STW subsidy, we estimate that the unemployment level in Italy during the Great Recession would have been almost 2% higher, and total TFP about 2% higher, but at a total welfare cost of about 2%. There are two main explanations for why STW remains desirable in Italy, despite the reallocation costs of the programme and its lack of long run effects. First, workers still value a lot the short-run insurance provided by the programme. Second, the level of employment was very low in Italy during the Great Recession and workers were facing very low probabilities of finding jobs when unemployed. By decreasing unemployment, and therefore competition, across workers in the labour market during the Recession, the policy also benefited workers. Authors' note: The authors are greatly indebted to all the staff of Direzione Centrale Studi e Ricerche at INPS for their invaluable support with the data and the institutional setting, and to the sponsors of the VisitINPS program for financial support. Boeri, T, and H Bruecker (2011), “Short-time work benefits revisited: Some lessons from the Great Recession”, Economic Policy 26(68:, 697-765. Cahuc, P, and S Carcillo (2011), “Is Short-Time Work a Good Method to Keep Unemployment Down?”, Nordic Economic Policy Review 1(1): 133-165. Cahuc, P, F Kramarz, and S Nevoux (2018), “When Short-Time Work Works”, CEPR Discussion Paper 13041. Giupponi, G, and C Landais (2018), “Subsidizing Labor Hoarding in Recessions: the Employment and Welfare Effects of Short-Time Work Programs”, CEPR Discussion Paper 13310. Tilly, J, and K Niedermayer (2016), “Employment and Welfare Effects of Short-Time Work”, working paper. Van Audenrode, M A (1994), “Short-Time Compensation, Job Security, and Employment Contracts: Evidence from Selected OECD Countries”, Journal of Political Economy 102(1): 76-102. As a matter of example, the German social security administration (IAB) does not collect data on its large STW program (Kurzarbeit). Most STW applications and reports are sent in a paper format to the Federal Employment Agency, and are not digitized. Only a sample of these reports has been digitized for the Nuremberg metropolitan area for years 2008 to 2010 and matched to IAB data (Tilly and Niedermayer, 2016). The graphs in Figure 1 report the estimated coefficients of event study regressions for different outcomes and different event-year definitions at the worker level. All estimates are relative to event-year -1 and are scaled by the average level of the outcome in that year. Individual and calendar year fixed effects are included in the event-time specification. The dashed lines around the estimates indicate 95% confidence intervals based on robust standard errors clustered at the individual level. For the treatment group (indicated by solid circles), an event year is defined as the first year in which the worker experiences a STW event, conditional on the worker being in a firm eligible for STW at event time -1. The first comparison group (indicated by solid triangles) consist of workers employed at similar firms, which are not eligible for STW. The second comparison group (indicated by solid squares) consist of workers employed at non-eligible firms and who experience a mass layoff at event time 0. Individuals in the two comparison groups are matched to individuals in the treatment group using Mahalanobis nearest-neighbour matching without replacement based on gender, age, job characteristics at event time -1, employment status, annual weeks worked, earnings, and firm size at event times -1, -2, -3 and -4, and main industry at event time-1. Total hours worked and total earnings are unconditional on employment. In Panel C, we report the evolution of all earnings, and all transfers received (including STW or any other social assistance programme or tax transfer).